There are 6 Assisted Living Facilities in the Milton area, with 2 in Milton and 4 nearby. The average cost of assisted living in Milton is $3,550 per month. This is higher than the national median of $3,346. To help you with your search, browse the 24 reviews below for assisted living facilities in Milton. On average, consumers rate assisted living in Milton 4.2 out of 5 stars. Better rated regions include Pace with an average rating of 5.0 out of 5 stars. Caring.com has helped thousands of families find high-quality senior care. To speak with one of our Family Advisors about assisted living options and costs in Milton, call (855) 863-8283. Milton is located on the Florida panhandle, and this tiny town along the Gulf of Mexico has fewer than 10,000 inhabitants. Residents at the two assisted living facilities (ALFs) in town have access to small-town ambience when out on day trips. For those desiring more options, there are an additional 21 facilities nearby. Within Florida, these communities, known as residential care facilities (RCFs) are licensed and regulated by the Florida Agency for Health Care Administration (AHCA). The Florida Department of Health (DOH) is responsible for performing facility inspections to ensure protocol is being followed. The cost of living in Milton is 10.9 percent lower than the national average. This makes it a potentially wise choice for seniors on a budget. As Florida has no income tax, seniors looking to save have more money to put towards higher quality care. Social security checks, pension income IRA and 401(k) are not taxed. Milton has an array of community resources for seniors, including The Guy Thompson Community Center, an organization that offers fitness classes, health education and games, as well as four senior centers nearby. Air quality is fairly good in Santa Rosa County. The American Lung Association gave them a C ranking. Some seniors with a severe respiratory illness may have trouble in this area. Violent crime in Milton has a score of 23, almost 10 points lower than the national average of 31.1 out of 100 (1 is safest). Property crime, on the other hand, is higher, scoring 49.1 compared to the nation's 38.1 average. The climate in Milton is warm and humid with a comfort index of 71 out of 100 (100 is ideal). It receives an annual 67 inches of rain and July highs around 91 degrees. Winters are mild with January lows of 40 degrees and no snow making it easier for seniors to get out and go all year round. Assisted Living costs in Milton start around $3,550 per month on average, while the nationwide average cost of assisted living is $4,000 per month, according to the latest figures from Genworth’s Cost of Care Survey. 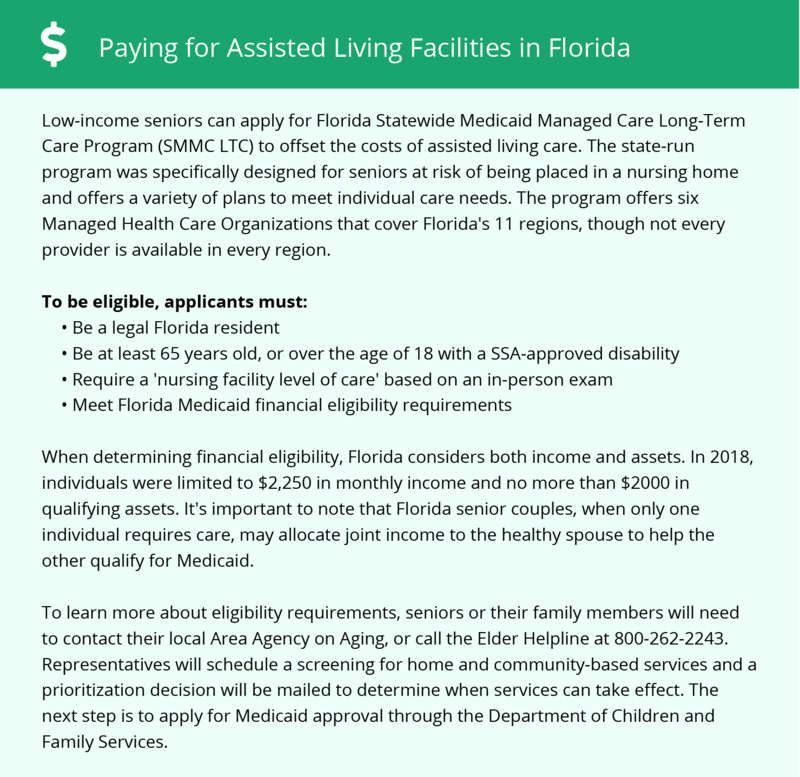 Qualified senior residents in Florida may be covered by the Statewide Managed Medicaid Care Long Term Care program (which replaced the former HCBS Medicaid waivers). Seniors who are not Medicaid-eligible are in luck as there are an additional six programs to meet these individuals needs. To see a list of free assisted living resources in Milton, please visit our Assisted Living in Florida page. Milton-area assisted living communities must adhere to the comprehensive set of state laws and regulations that all assisted living communities in Florida are required to follow. Visit our Assisted Living in Florida page for more information about these laws.